Well now! Let’s mix up the Dolch sight word flashcards to include the seasons. Why not? You can go plain and simple with the black & white and color Dolch sight word flash cards, you can go seasonal with these cards, or you can try the holiday themed Dolch flashcards. Whichever set of flashcards you choose, the point is for you to have fun teaching sight words and your kids to have fun learning sight words. Go to this page to choose from even more Dolch sight word resources. Spring is in the air! Pretty flowers abound in these spring Dolch sight word flashcards for pre-k. Eight pages, six words per page. Can you smell those beautiful flowers? What a lovely aroma. Spring themed Dolch sight word flashcards for primer aged kids. 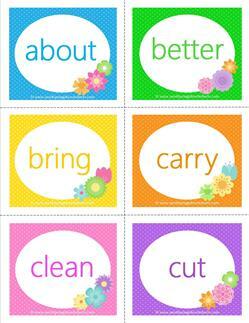 Take a stroll down a beautiful garden path with these spring themed Dolch sight word flashcards. Eight pages, six words each. Take a leisurely walk down the garden path to these beautiful spring themed Dolch sight word flashcards. Pick this set and enjoy! 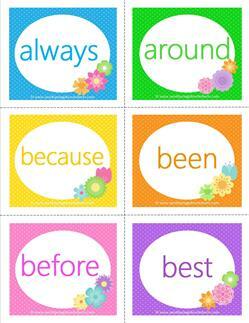 These spring themed Dolch sight word flashcards are sure to make your day in their cheery colors. Perfect for small groups. 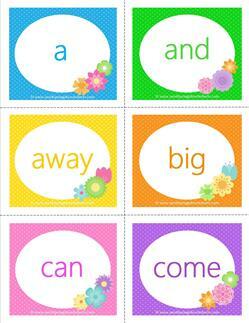 You can feel spring in the air ... now you can feel it in your class with these Dolch sight word flashcards! Let the sunshine in with these summer themed pre-primer Dolch sight word flashcards. Eight colorful pages, six words per page. 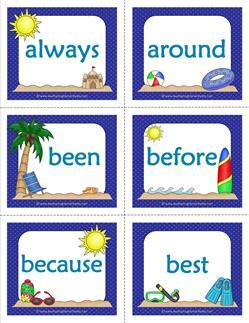 Kick off your shoes and head into the surf and sand with these summer primer Dolch sight word flashcards. Ten pages of 52 words. Grab your surfboard (or your beach chair!) and head on down to the beach with these fun summer Dolch sight word flashcards. My summer themed Dolch sight word flashcards for second grade are sure to get you thinking of fun at the beach! Nine pages. Check out these fun and colorful Dolch sight word flashcards of 95 nouns in a summer theme. 17 pages. 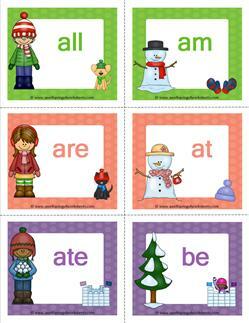 Cute characters adorn these winter themed Dolch sight word flashcards. Eight pages, 40 words, six words per page. Cute kids, snow forts, and warmly dressed pets adorn these winter Dolch sight word flash cards. Eight pages, 52 words, six per page. Snow and ice are welcome here! Get your winter themed Dolch sight word flashcards, too. Eight pages of 41 words, six per page. Winter themed Dolch sight word flashcards to go with your winter time lessons! Nine pages of 46 words, 6 words per page. Dolch sight word flashcards in a cute winter themed graphic - anyone want to build a snow fort? : ) Eight pages, 6 words per page. Spunky pumpkins with polka dots and stitching lead the way to beautiful fall days with these Dolch sight word flashcards for pre-primer. 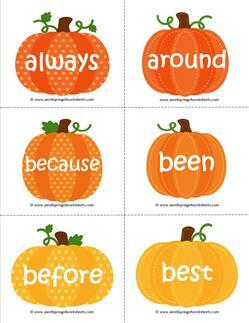 Spice things up with this set of fall Dolch sight word flashcards for primer! Cute orange and yellow pumpkins with white lettering. Pumpkins abound in these fall themed Dolch sight word flashcards for first grade. Great for reading groups and literacy centers! Fall is in the air when pumpkins appear with their big green leaves. Enjoy these fall Dolch sight word flashcards in your class in October! Pumpkins, pumpkins everywhere! 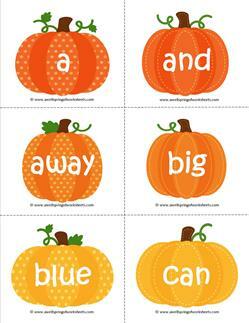 Celebrate fall with these sweet yet whimsical Dolch sight word flashcards. Your kids will love 'em! Settle right into fall with these spunky little pumpkins! These fall themed Dolch sight word flashcards contain 95 nouns on 17 pages.